In October 2007 I wrote a short feature on The Calliope and posted some label scans of their 45s. I've recently been contacted by singer/songwriter Jim Andron and rhythm guitarist John Ray of the band, who have contributed important information about the band detailing some interesting facts that I'm gladly updating my blog with. 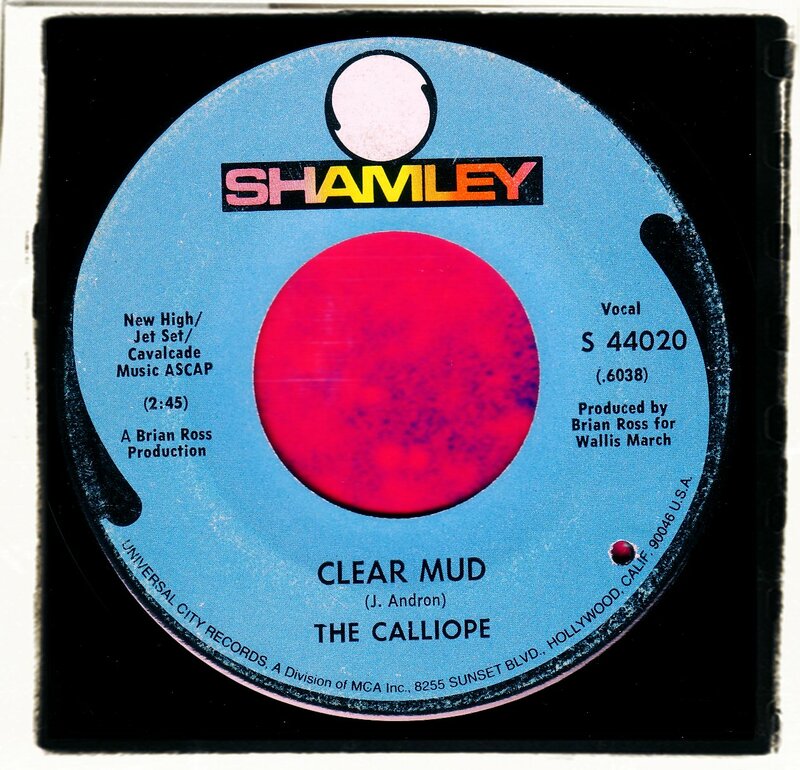 My earlier Calliope post can be located in the archives. 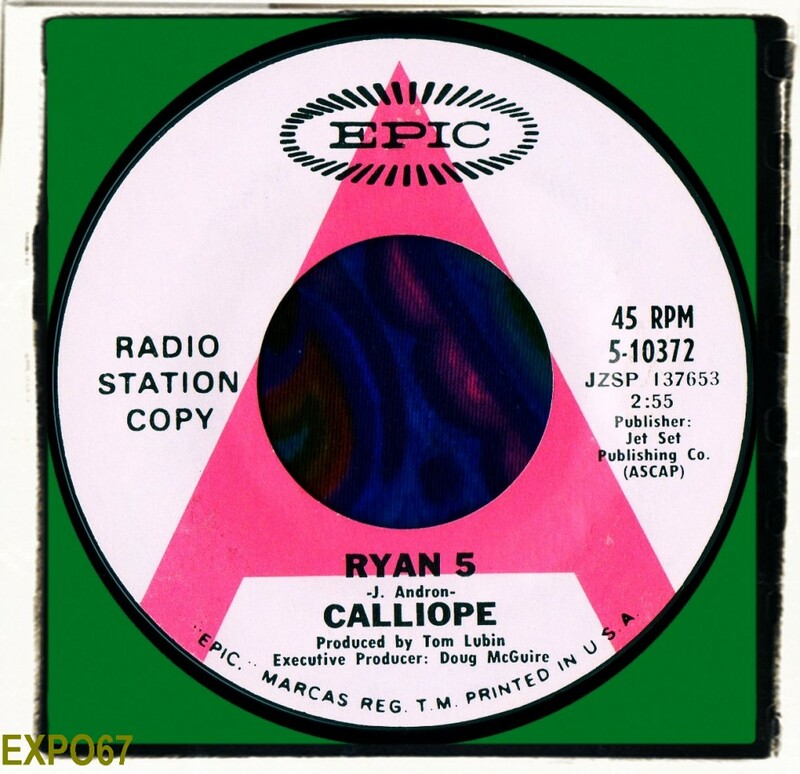 Their first 45 coupled the psychedelic 'Ryan 5' with 'I'll Take It Back'. I've since learned that the record had a small local release on Jet Set Records in the Santa Barbara area. My interview with band leader Jim Andron covers this. The record was picked up by Epic for National release and again sold quite well in their locale reaching the Top 40 KIST charts during February 1968. Where did the band hail from? We were all from Santa Barbara. How did you all get together? School pals? Jim Saad (drummer) and I knew each other from the grade school orchestra; we were both percussionists. Jim was two grades behind me, but was always a fantastic drummer. I had played drums in several other bands when I was 13-14, when I was 15 I picked up a guitar and started playing with Jim, Tony Riparetti (lead guitar) and Dan Protheroe (bass). We were called Four Bourne. Jim lived right up the street, Tony and Dan were classmates of Jim. They were all young, around 13, but could all really play. We added Sue Ferrell and John Ray later. (Sue ended up marrying Jim a few years later; they had a band called Sue Saad and The Next, whom you may have stumbled across. What was the age of the members when you first formed the band and what year was this? Jim, Tony and Dan were 13, I was 15. I think it was about two years later that we added Sue and John. I know we called ourselves The Chocolate Mess for a while, Then Calliope. Jim Andron; six and 12 string guitar, organ, and vocals. Who were your main influences? Very much a California Band. 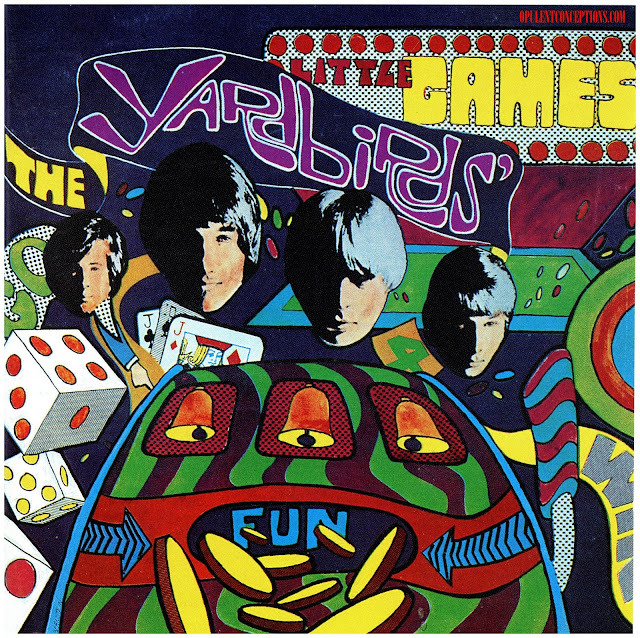 Byrds, Airplane, Buffalo Springfield, Association, and of course The Beatles. 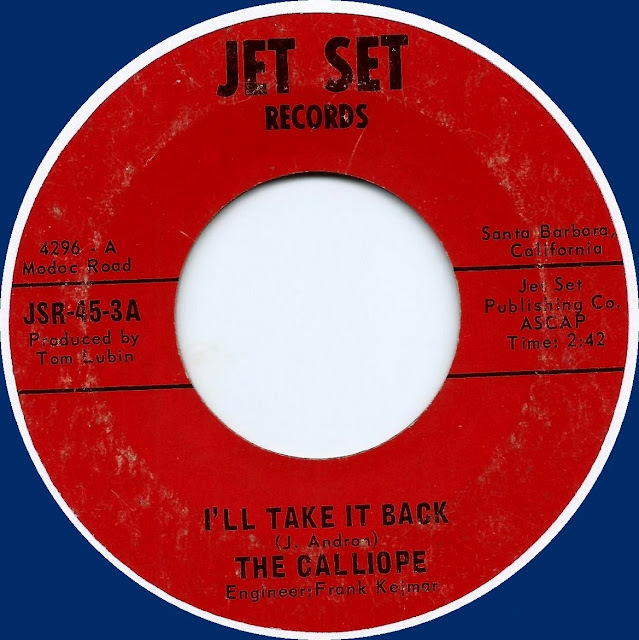 What studios were used to record The Calliope material? 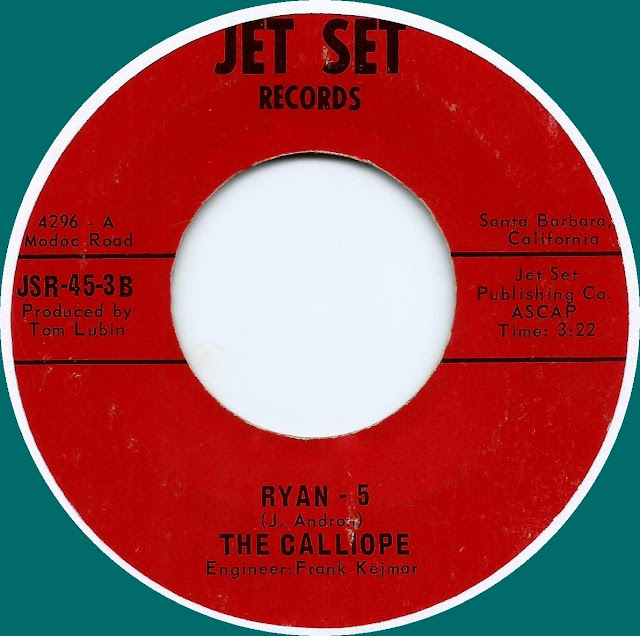 You mentioned in an earlier email that 'Ryan 5' was released on Jet Set Records. Was this just a local release of a few hundred records? 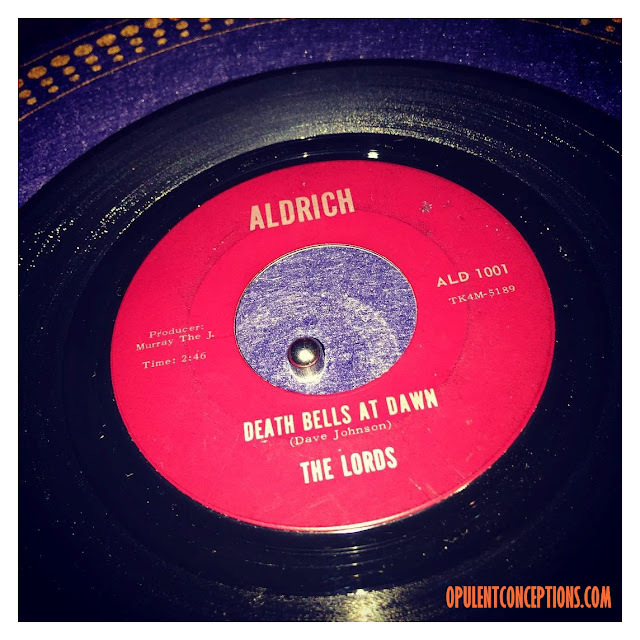 Did this local release get Epic Records interested in releasing it as a 45? Did the band get any reviews in magazines/papers at the time? 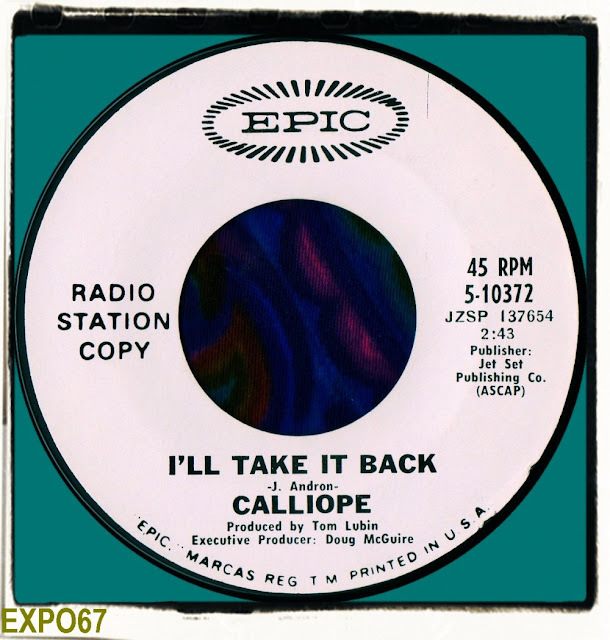 You wrote every Calliope song that got released on record. Did you record any other songs that were not released at the time? Did you have any other original songs that were played at gigs? As far as official recordings went, that was it. 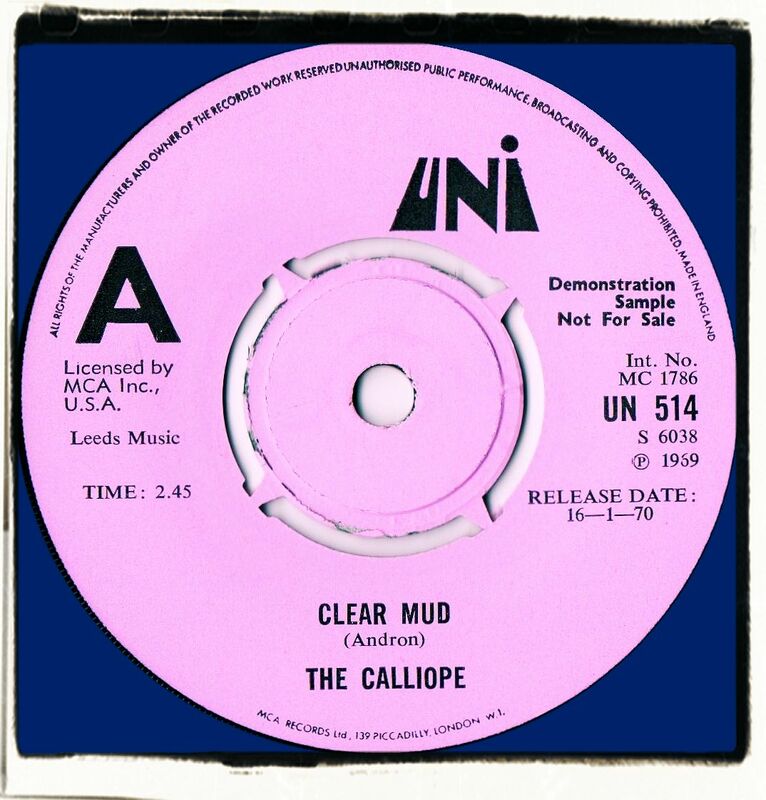 We did have other originals--we certainly could have done an album, had things worked out. Tell me about the early gigs. Where did the band play, who did you support or share the bill with? Oh, boy. That’s going back a ways! We played the high school dances, and fraternity parties at UC Santa Barbara. We actually played my senior prom, along with The Peanut Butter Conspiracy. We did a gig with The Merry-Go-Round once, which started my interest in that band. They premiered a song that night that I did my best to remember, and that I taught to our band from memory. We were the only band doing Merry Go Round songs, especially ones that hadn’t been released yet! I think that the gig that made us aware that we were on to something was a battle of the bands we played early on--we were up against the best bands in the area (ever hear of The Giant Crab? They were legendary!) Anyway, we were really young, and thought we had no chance, but we won the thing, which included a sound system prize. After that, we really thought we had a shot. We WERE quite good--these kids really took it seriously, especially Jim and Dan, and that dedication was contagious to everyone else. We had vocal rehearsals, and 4 and 5 part harmony. Nobody our age was doing that. I learned a lot about vocal arranging that I still use to this day. Have you got any other recollections about mid 60s California? I feel, in retrospect, that we were at ground zero for the most important and influential period and place in rock music history, except for the British Invasion. 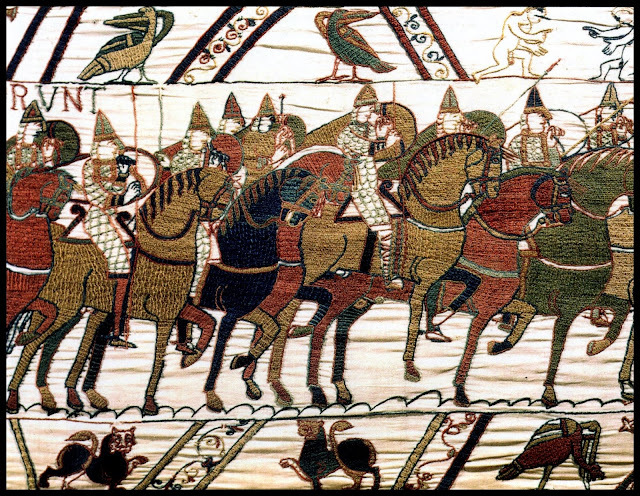 Technology was evolving by leaps and bounds, which went hand-in hand with the evolution of the music itself. We sat in on that, and learned a thing or two. Down the hall, Simon & Garfunkel’s producer was working on the track for “Only Living Boy In New York”. It was an incredible time to be a part of, if only in a ‘Forrest Gumpian” kind of way. The band worked with the famous Brian Ross. (He's well known for producing many garage/psych bands in California especially The Music Machine) What was it like to work with him in the studio? To be honest, I don’t remember much about working with Brian. I do remember that he LOVED VSO (variable speed occillator). He seemed to think any problem could be solved by speeding up the track. Beyond that, he was involved in the selection of the songs we recorded, but in the studio, I don’t remember him being very involved. 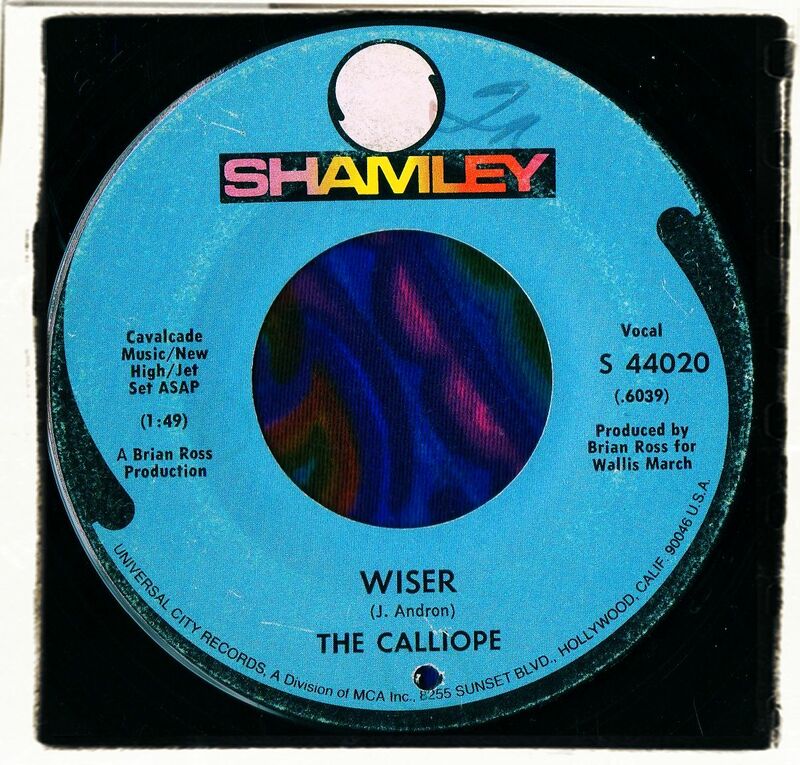 What brought about the demise of The Calliope? Well, Jim’s family moved to Tustin, CA, about 100 miles south, and Sue’s family moved to Las Vegas. We did make our last recording under those circumstances, coming down to Tustin to rehearse the record, but when the record didn’t take off, it just got too difficult to keep it together. 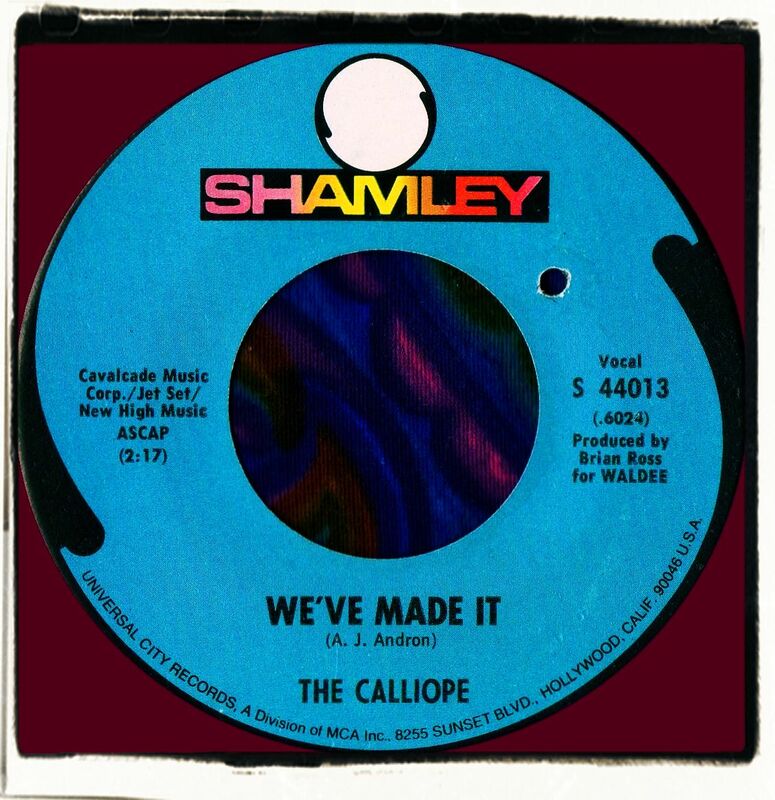 Did you play in any other bands after The Calliope? Yeah, there were other bands, but nothing of consequence. It's funny I remember several other bands, I can't remember if they were before, during or after. Eventually I decided to go the singer-songwriter route, and moved to LA after graduating from UCSB with a degree in music theory/composition. I ended up going on the road with the New Christy Minstrels folk group, where the vocal arranging chops I’d developed with Calliope came in handy--I was quickly made music director, and had to arrange for 7 to 9 voices. I wrote songs for other artists and had quite a few published and recorded, but always more in the pop realm, than rock. I did a bunch of stuff for Disney records, full orchestral sessions where I could use my music major writing and arranging chops. I also did a bunch of music for computer games, including 'Who Framed Roger Rabbit" and "The Game of Life". I was a member of this group until June of 1969. I came to our rehearsal studio and the group were rehearsing without me. I seemed to be on the out so left the band and never heard what happened since. Wewere all just out of high school. I thought that we had a good chemistry as far as the writing was concerned. Jim Andron did the main writing. We were all from Santa Barbara and did our best to try to "make it". Jim Andron played the keyboard and some guitar. Tony was the lead guitar. Jim Protheroe play bass, Jim Saad played drums, I played rhythm guitar. Susan played the flute and sang. Lead vocals were done by Jim Andron and Susan. I sang the high tenor harmony. 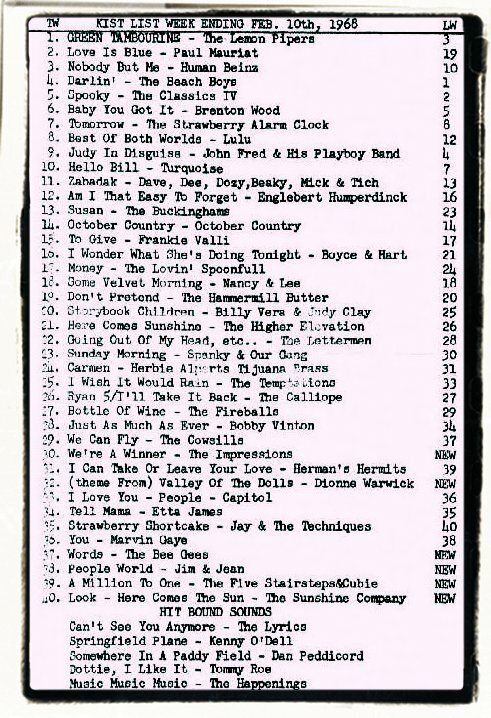 Besides our own songs we played Jefferson Airplane and other period songs. I've always wondered what happened and why. So if anyone else comes across this and knows something I would like to hear from you. 'Clear Mud' / 'Wiser' (Shamley 44020) 1969 also released in the UK on Uni 514 on 16/01/70. This is Jim Saad, drummer for the Calliope. Jim Andron was and is a great musician and friend. I did alot of studio drumming and played with A&M Records Vance or Towers, my own band Sue Saad & The Next (produced it with Richard Perry), played on Tommy Tutone's LP, and received a gold album from Sheana Easton for our song "Prisoner" written by Michael Towers, Tony Riparetti, and myself. I played on Jimmy Messina's solo album after Loggins & Messina. Jimmy is one of my favorite producers/writers/performers. He was great to work with. I am now helping my son Alex (13) start a group. He is playing drums. Thanks Jim Andron for all those great years of growing, playing, laughing, and reaching for our dreams. You were instrumental in all of it. Thanks to Sue, Tony, John, and Dan too. Love you all. Wow! This post and its comments are a huge help for me. I'm trying to locate info about the great bands of the California Gold Coast during the Sixties for my blog, California Gold Coast Dreamin'. Jim, would you have a photo of the band that I could use? If so, please contact me at skwaller[at]gmail[dot]com, or use the contact form on my site. Thanks, Flower Bomb Songs for your site. I've already linked to you and will be sure to cite you! Ryan 5 was a great tune, thanks for the interview. Searching for Jim Saad and I found this blog. If you read this Jim, I am Robert E McPherson and I took drum lessons from you when you were teaching in Santa Barbara from your home and you were Studio drummer for Two Dot Studios and this was in 1972-1973. I hope you are doing well and are still playing as amazing as you were back then!